This simplified version of our library was designed to display all our models in the fastest way possible. 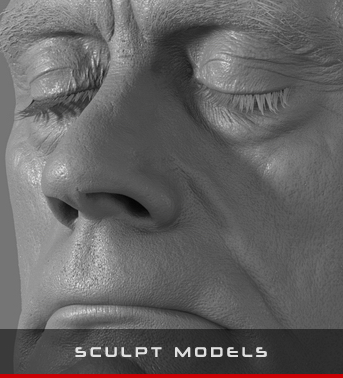 Because it takes a lot of time to prepare and publish models in the store, we want to give our customers access to the most recent models scanned as fast as possible. All new models will be added to catalogs first. You can also access catalogs from the Search page by clicking on the orange button in the right top corner. We would like to introduce custom order deals. If you require multiple models with all or selected expressions, we offer custom order arrangements and dynamic discounts. These orders will be paid for by invoicing and bank transfer for your convenience. Data can be delivered to you on a physical drive or through our FTP. All custom orders will be delivered with full sets of photographs in both CR2 and JPG versions. OBJ+Texture delivery possible if needed. We will work with you directly to make sure you get the best service possible. Additionally, we offer further discount that will depend on the total order price. Please contact us to find our what kind of deal you can get. If, for some reason, you can't find what you need in our store and you require specific range of models, we offer custom scanning services with exclusive and nonexclusive rights to the data. Please contact us to find our more.